gingivitis | To Health With That! Just like there are so many factors that cause inflammation, there are also so many consequences. 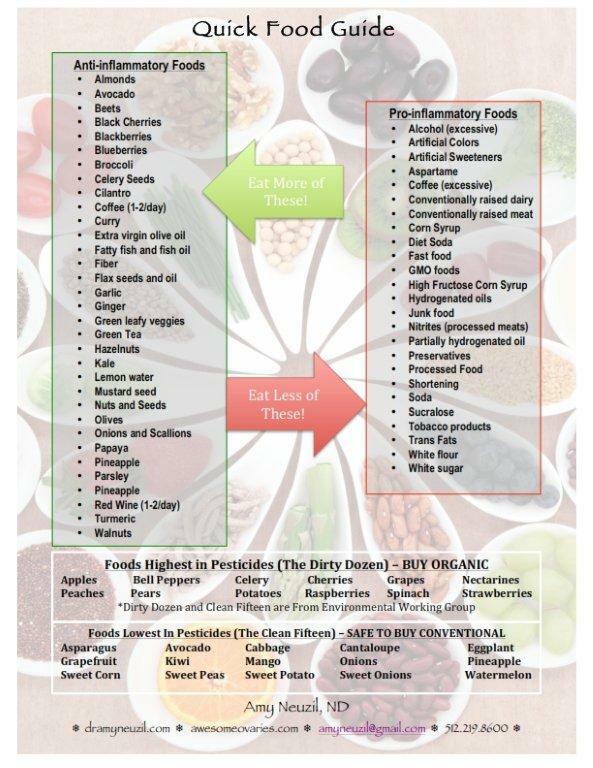 This great picture was borrowed from this excellent post from LSU Ag center on foods that help inflammation. Overeating. Every time you eat you body goes through the process of metabolism. Metabolism is great and necessary – this is how your food turns into energy and useful nutrients in your cells. Metabolism also releases toxic by-products, your old friends the free radicals (if you can’t remember what a free radical is then check out this post on antioxidants). Eating is necessary, but overeating is not. In fact, in a survey of people who live to be over 100 years of age one of the only common factors is that they ate low-calorie diets. So essentially eating a little less than what you need gives all the benefits of good nutrition, where eating a little more causes inflammation. This is where nutritarian eating gets really important – getting the most nutritional value out of your food so you don’t have to overeat. Food Sensitivities. Obviously exposing your body to something every day that you react badly to adds up. I found out (entirely thanks to a patient of mine, who insisted if she had to do the “stupid elimination diet” then so did I) that I’m sensitive to both wheat and soy. Getting those two out of my diet has made a huge difference in my level of joint pain, my energy on a day-to-day basis and even my skin. If you don’t remember about food sensitivities or can’t remember how to test at home for free then look here. Gingivitis. 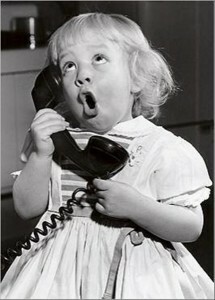 Yes, it sounds ridiculous but floss every day and make sure you brush your teeth at least twice a day. If you have a chronic inflammation in your gums, or gingivitis, then it raises your total body level of inflammation. Even this insignificant thing adds up – and gingivitis has been shown to connect with inflammation specifically in the heart and blood vessels – which is something you don’t want. Approximately half of all adults in the US have gingivitis so talk with your dentist and take care of your mouth. This is one of the most common and most easily fixable factors that cause inflammation. Far more so than reducing stress (which has to be the most nebulous and difficult thing in modern society). Stress. I know it’s a hard one to change, but learning to cope with high stress levels and learning some stress-relieving tools can drastically improve your health. There is a reason why the most common time to have a heart attack is Monday morning at 8:00 am, and I’m pretty sure the timing has nothing to do with cholesterol. And yes – Monday morning at 8:00 am is a real thing. Not Enough Sleep. Sleep is a cornerstone of good health – this is when your body does a lot of the repair and restore functions, especially in your brain. Not getting it means that you don’t ever take out the trash, which obviously makes a mess in your body. Without sleep you don’t get rid of as many toxins, repair as much damaged tissue or get rid of those pesky free radicals. Getting enough sleep is vital to health. Lifestyle Choices. Choosing to drink alcohol to excess, smoke, or use recreational drugs takes a toll on your health. It’s not that I’m anti alcohol – I’m pro-moderation. Especially during times where other stresses for your body are higher. Ironically the times when you’re stressed and crazy as a human (which is when most people want to smoke and drink the most) are also the times when those behaviors will do the most damage because your body already has too much on it’s plate. Obesity. As we discussed above there is a link between carrying extra weight and having higher than normal levels of inflammation. We don’t know why, but there are lots of theories about fat cells creating their own environment and secreting their own hormones and inflammatory proteins. This makes losing weight even more important for your health. 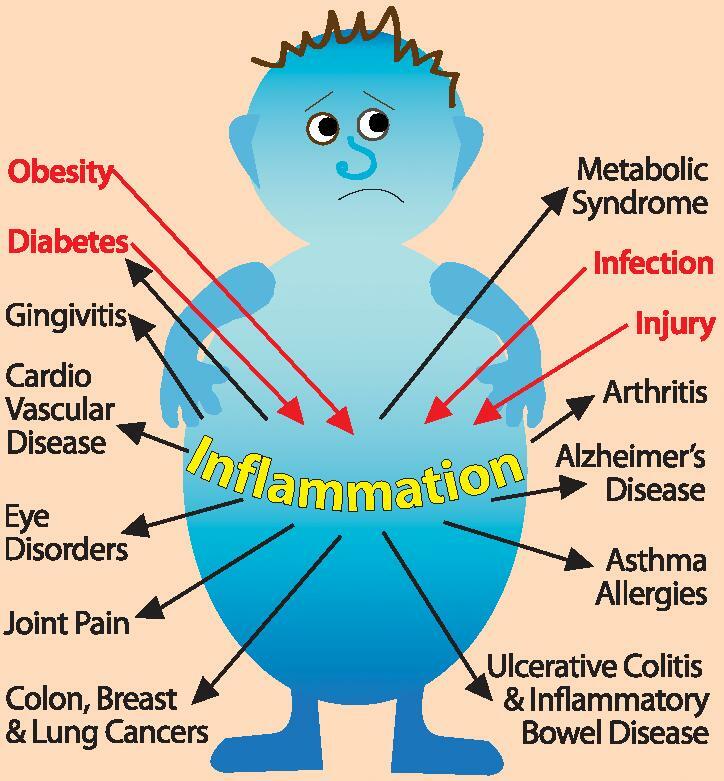 Just like obesity creates more inflammation, inflammation makes losing weight harder. Reducing some of the other factors that cause inflammation can help your body to lose weight more easily. Family History. Some people do just become inflamed more easily than others. Heart disease, rheumatoid arthritis, eczema and allergies all have some genetic link. Even if your family has a strong history of inflammatory disease you can still work to reduce your own inflammation – in fact doing the work to protect your health now will have a far greater pay off for you long-term because you may be able to avoid the family conditions. Environmental Toxins. Everything that you are exposed to – everything you breathe, touch, drink in your water or eat in your food has to be processed by your body and increases your likelihood of inflammation. This includes pesticides, herbicides, air pollutants, household chemicals and cleaners, food additives, flame-retardants in your furniture and perfumes. You are literally surrounded. It is unrealistic to think you can eliminate all toxins, but you can work to minimize them. The simplest steps are things like switching your body care, home fragrances and cleaning products to natural, less harmful alternatives. Get a water filter, avoid processed foods and just generally try to avoid the yuck as much as possible. Chronic Infections. Sadly, many people have infections they’ve been carrying around with them for years. It is a sad but true fact that there are many walking wounded out there. One of the most common is gum disease, which is a bacterial infection that many bodies have to deal with day in and day out. Also many viruses can become chronic and often show up as non-specific symptoms or diseases such as chronic fatigue and Fibromyalgia. If you have any concern that this could be you then call your naturopathic doctor right away or schedule a visit with me. Chronic infections are common and can certainly get in the way for good health. Yes – eliminating them completely is actually impossible in the modern world. The great hnews is that taking small steps works. These factors that cause inflammation are all things that you can chip away at in your own life. If you’re only ready to make one change, then add flossing daily. It’s a way bigger deal than people think. If you already floss, then see if you can make time and space for more sleep. If you floss and you’re sleeping enough for you then how about making your diet a little more nutrient dense? Nutritarian eating is a great thing, just like focusing on anti-inflammatory foods. If you’re stumped about what are anti-inflammatory foods and what aren’t then here’s a handy post about it. Just take everything one step at a time – don’t overwhelm yourself. Having a healthy lifestyle isn’t about making drastic changes – it’s about doing small things on a daily basis that just turn into healthy habits over time. Reducing the factors that cause inflammation reduces your risk of heart disease, many types of cancer, neurological disease, joint degeneration, skin conditions and a host of other problems so it’s worth it to start taking small steps today. 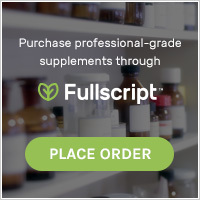 This entry was posted in Natural Health and tagged factors that cause inflammation, gingivitis, good nutrition, inflammation, inflammation and chronic infections, nutritarian on April 21, 2015 by amyneuzil.